On Tuesday, May 3, I will be at the opening of an exhibit at MOMA in New York City. I am excited about this particular opening because the artist is my wife’s cousin, Francis Alÿs. Francis is Belgian but has had his home and studio in Mexico City for a number of years. Over the course of my 21 years of marriage to Maureen (cousin to Francis), I’ve had the pleasure of being with my wife’s family in Brussels many times and staying in Francis’ ‘apartment’ that he keeps there. During meetings this past week in New York City and Philadelphia regarding CLOUD in both finance and health, two separate questions were raised that help frame a deeper discussion regarding WHO I Am™. 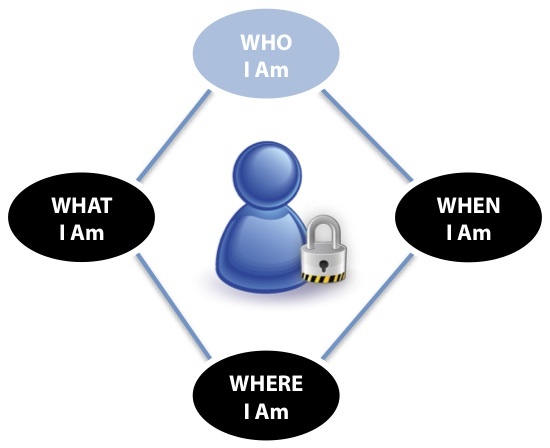 The first question posed was in relationship to Facebook Connect, OpenID and CLOUD’s concept of WHO, and the second was in regards to whether WHO I Am or WHAT I Am would be the container by which various dimensions and data would be stored. Technology Problem or Time for a Paradigm Change? Since CLOUD believes the future of the Internet lies in a paradigm shift and not just a technology shift, the initial drafting of CTML (contextual markup language) is still in the future. Crafting a new standard while the issues are still framed by paper-based paradigms like web pages would be putting the cart before the horse. However, it is useful to discuss some of the more philosophical underpinnings embedded in these questions from our northeast roadshow. Since log-ins and forms have boxed us in to solutions that mimic how we’ve handled these issues in the past, it is better to not allow them to box in our visions of the future. Rather than thinking about WHO I Am in the context of web pages or forms, let’s think about this question in a broader way. Does My Birthday Define WHO I Am? Each of us is defined by not only our relationships with other people but by a collection of information that is gathered up over a life time. Does our address or our birth date really define WHO I Am? Birthdays or addresses, in some ways, are simply tags (WHAT I Am), tags that mark some aspect of our paths through life. As discussed by our recent posting on WHEN I Am, even birthdays are not fixed in time as evidenced by our own country’s change in calendars in the 1700s that moved us from the Old Style to the New Style calendar, a change that also “moved” George Washington’s birthday by some two weeks. Of course, the date of our birth is an important mark along any path. It is “where” we each start. It is the ultimate expression of two WHO I Ams combining so as to create a whole new WHO I Am, but the birthday as a discrete data element doesn’t define us or define our WHO. No matter how well OpenID captures my data and enters it efficiently into the multiple web pages and associated forms, it is still entering data into forms. And, that is the problem. Even the OpenID foundation web site recognizes this, “OpenID is a safer, faster and easier way to log in to web sites.” But I don’t want to log into websites. That’s the whole problem. With all of these websites, I have my data scattered everywhere. Having my birthdate entered into more web silos, faster is exactly the problem. Why reenter the birthdate at all? Somewhere on the Internet, there exists a data point that validates that I was born. I have in my filing cabinet a physical “tag” that proves where I was born, when I was born and to whom I was born. It is called a birth certificate. That “tag” is the most valid version of my birthdate in existence. I’ve certainly written my birthdate down on a lot of forms in my over 40 years on this planet, but not one of them is validated. The OpenID-style approach makes it easier to further populate the Internet with this same date. But that completely misses the point. With the many eGovernment efforts occurring globally (I was born outside of London), it is entirely within reason to expect that my birth certificate, or more importantly, the data and tags contained within it, would be accessible electronically. This validated birthdate should never be required to “move,” just like web pages don’t move. It should become one of many tags or threads that intersect to form my evolving WHO I Am. On my path through life, I have also been tagged by the United States government as a citizen (of which I am very proud), and every ten years, I receive another WHO tag from the US Government in the form of my passport. None of these tags are part of my identity, but the accumulation of these tags create a very robust “tag cloud” that makes it quite clear that I am WHO I say I am. 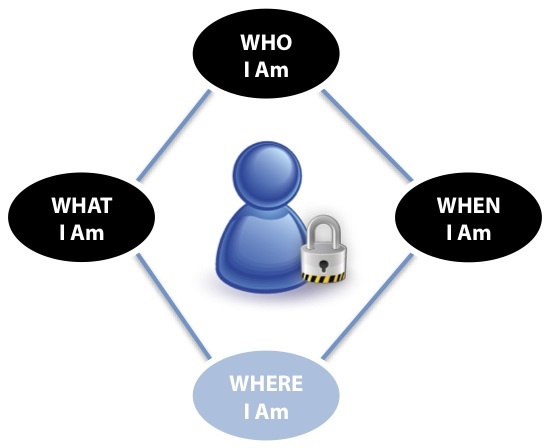 So, WHO I Am is a really a tag cloud and not a data container. It is a cloud formed by our connections to other people and other experiences. These connections are much like the threads of a weaver (discussed further in my End of LInearity blog), and these threads/tags “flow” through my WHO I Am. The richer these connections; the richer and more colorful is the fabric that is woven by the “flow” of my tags. 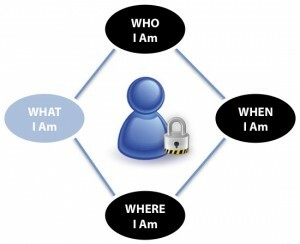 As a result of the distributed nature of information in a CLOUD-enabled Internet, the idea of “logging in” goes away. It is entirely within reason to envision a CLOUD-enabled web page or other presentation layer that allows me “to pierce my fabric” (in the words of a recent lunch companion) to see my connections to other WHOs or my other WHATs (from health to education to finance and beyond). No logging in necessary, because that is just not WHO I Am. We live in a world measured by time. The earth has always moved around the sun; the earth has always rotated on its axis; but we have not always measured WHEN in the same way. We’ve gone from sun dials to sands through the hourglass to uranium clocks and Greenwich mean time. This makes thinking about WHEN I Am™ an interesting issue, not only from a metaphysical perspective but especially with respect to both the way in which WHEN captures the specific aspects of time and how WHEN impacts our WHO, WHAT and WHERE. Places, the recent introduction by Facebook, has opened another vector in the ongoing privacy discussion, a discussion sparked not only by Facebook, but by Google and others. Google’s Street View is another actor in this on-going privacy debate and Eric Schmidt’s own comments about privacy reveal a distorted view of the key component of the Internet, ME. As was mentioned in yesterday’s post on CLOUD’s Dimensions, Who, What, When and Where look different in a world of ME 1.0, as opposed to a world of Web 2.0. This post looks specifically at one of these four axes, WHERE I Am™, and provides more detail on CLOUD’s thinking on this particular dimension. 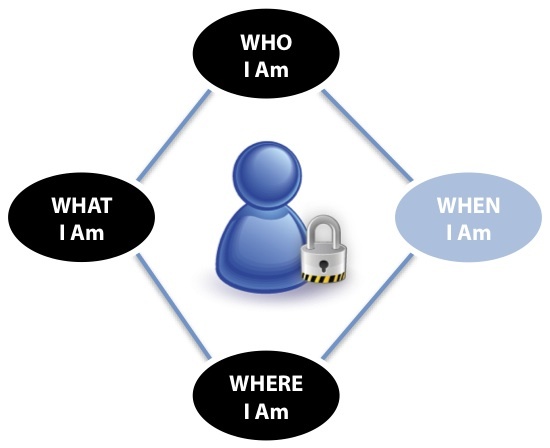 To frame our discussions on dimensions, the diagram to the left will become more prevalent in CLOUD’s public facing conversations about its work. In this case, WHERE I Am is shaded to indicate that for the purposes of this conversation, WHERE is a fixed vector or axis. As was pointed out in the first post on the topic, there are four dimensions to the future CLOUD “hypercube”: WHO, WHAT, WHEN and WHERE, and it has been several weeks since I posted some thoughts on the third dimension in this series on WHEN. WHAT I Am has been left until last, because as I’ve discovered, it is the hardest one. Fortunately, during my flight over to Brussels for the Sibos conference in Amsterdam a week ago, the reasons for the difficulty started to dawn on me. As we point out in our video vignette on Separating the WHO and the WHAT in the CLOUD, there is a significant difference between data elements, the entities collecting the data elements and the databases in which they are stored. Nova Spivack of Lucid Ventures made an excellent comment about this part of the semantic web during Sibos in Amsterdam. In his words, “In the semantic web, databases wrap themselves around the data.” That is a wonderful framework by which to go deeper in to my thoughts on the final dimension of CLOUD: WHAT I Am™. Copyright © 2019 The End of Linearity All Rights Reserved.